My iPhone tells me that I have just won my 564th game of Free Cell. It reliably informs me that I have spent 103 hours and 23 minutes achieving this milestone. Now, that is a serious amount of time to have wasted playing solitaire. But has it really been wasted time? I have come to realise that this game has taught me some interesting lessons on how to get ahead in life. To achieve 564 wins has required me to play 713 games, a 79% success rate. But what is remarkable is that I am now on a winning streak of 308 games in a row. How is it possible to move from a 63% success rate in the first 405 games to a 100% success rate in the next 308? There is clearly something going on here. By my calculation, to achieve a winning streak of 308 by chance based on a success rate of 63% would be more than a one in a novemdecillion chance (I looked it up: 1 in 10^60). Now, if this change of form had been achieved in a business setting, scores of academics and management consultants would be beating a path to my door to discover the ‘secret sauce’. Is this simply an application of that oldest of insights, the learning curve effect? Or have I discovered a fantastic new winning technique, that can be written up in a blockbuster best-seller? The truth is that my change in success was down to the simplest of changes in strategy: I just decided that I would stop giving up when I got stuck. My wife Amanda had told me that you could always win at Freecell. But faced with the hard evidence from my first 405 games, it was easier for me to believe that she was exaggerating or that there was something different about the version of the game I was playing (“it won’t work here”). But eventually I decided to persevere. Use the ‘undo’ and the ‘restart’ button to try, try again if at first I didn’t succeed. Now although this is a simple change in strategy, it is far from an easy one (my longest ‘win time’ is 1 hour 10 minutes). I think there is a life lesson in there. So now I have a new challenge. Can I prove that you can always win at Free Cell? By my calculation, based on a winning streak of 360, I can be 95% sure that the chances of having an unwinnable hand are less than 1%. To be 99% sure that the chances are less than 1%, I’ll need to extend my winning streak to 500. Or maybe I should just believe Amanda. You’ll probably think it pathetic that I have nothing better to do than calculate obscure statistics. You’re right, I’d better go and do something more useful. 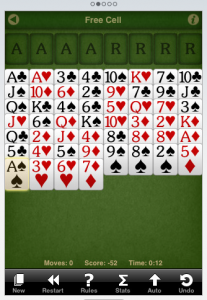 I’ve got an unfinished Freecell game to solve. UPDATE: The winning streak has now been extended to 500, after another 33 hours. Something of a scare 11 games ago, when it took me 1 hour and 21 minutes to win and almost had me giving up!